As easily as we forget how little we know, we're even better at forgetting what children don't know. Imagine a child who spends her life at cocktail parties. Her mother carries her on her hip the first few months, pushes her in a special party stroller the next year or two, then allows the child to wander among the adults as a toddler, picking up snippets of conversation. She's develop a cute cocktail personality, might even comment on the stock market, on derivatives, on the price of petroleum. She could rattle off an opinion on the financial melt down and tsk the current administrations health plans as she downs her third Shirley Temple of the evening. Like most folks in the room babbling on about the same things, she's know near nothing. So long as the cocktails keep coming and voices keep humming, no one notices, no one cares. I cannot compete with cocktail parties. Cocktail parties numb the cortex and feed the limbus. A good party makes everyone feel good just to feel good. There's a reason the pretty folks thinking pretty thoughts drink pretty drinks. Children, of course, cannot easily use ethanol to numb their thoughts, but we've provided plenty of tools that work about as effectively--iPods, Vidego 28s, and iPAQs take your child places that exist only in human imagination. The human imagination is truly a wonderful gift, but it pales next to the life outside your window. Or inside your window. Even on your skin or your rug. So we "invest in our economic future by providing the high-quality education our kids need to compete in the global economy." We do need to protect our 401ks. 'Scuse me while I freshen up my glass. A good science education might just be incompatible with Arne's aims. A decent education might get some children to question our assumptions. Science education promotes a living democracy by helping to create citizens capable of critical thought and healthy skepticism. I may be naive, but I believe that's why public schools exist, to maintain a functional citizenry, not necessarily to provide more effective workers for Citigroup or Microsoft or Abbot Laboratories. Did you hear? It was all worth it! at a Fortune 500 company! If anyone can show me Arne equating public education with maintaining democracy (as opposed to economic standing) I'd be much obliged. Thank you . Biology is, of course, the study of life. Life depends on energy. A tiny portion of the energy thrown off the sun gets absorbed by Earth, and living things use it to live. Much of it is stored in sugars and fats--sunlight is not constant. Some of the stored energy remains as fossil fuels. Our current economy depends on folks consuming more than they need and using more energy than the sunlight now provides. A child well-versed in biology might even ask if a global economy based on modern capitalist principles can be sustained. You won't, however, see that asked on a mandatory state test given to comply with the That-Which-Is-No-Longer-the-NCLB Act. I cannot compete with an iPod, but that's OK, I serve a different purpose. If I yank off the iPods and tell a child to study DNA because it will be good for her (or at the least threaten withholding her high school diploma if she refuses to bend to my curriculum), I might be able to sneak her past our state biology exam--a cocktail's party view of biology may suffice to get the diploma but see below. If I truly ignite her curiosity, though, watch out. A thinking animal can wreck a good cocktail party--there's a reason Socrates was served hemlock instead of a highball. Thinking animals started this American experiment back in the 18th century. The experiment depends on a truly educated, interested citizenry. I'm not convinced Arne wants that, and that may drive me to drink. 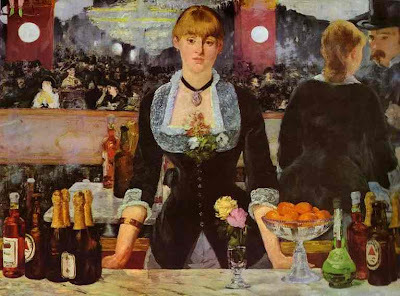 The painting is A Bar at the Folies-Bergere by Edouard Manet, 1882. 1) How can we trust the science you are teaching... is it any different than what taught 500 years ago and was assumed to be accurate then????? doubt is an important part of critical thinking. The question is a marvelous one (doubt is the crux of good science), but reveals the student's subtle misunderstanding of how science works. While some science is mostly observational, much (maybe most) of science deals with models designed to explain the observational data (direct and indirect) that we have. Many models are in flux, and even the most solid models must change if the observations do not fit. Perhaps the biggest change in the past 500 years (at least in western culture) is the declining influence of the Church in our interpretation of observational data. Galileo walked a fine line--he knew what he saw--but needed to be careful with his models. Heck, galaxies outside our own were unknown until my grandfather was 28 years old! There is a difference between cynicism and skepticism--I hope you tackled your student's remarkable question in a way that promoted the latter. The way science is often presented in schools, though, I fear we may be producing more cynics than skeptics. I cringe every time I hear an evolution "debate" reduced to two camps tossing mud. "there's a reason Socrates was served hemlock instead of a highball." How's this for critical thinking....what if he WERE served alcohol instead of poison..what might his legacy have been then? I suspect it would not have made that much difference, since the Socrates we know is the image created by Plato (and others), and I suspect that Plato was fond of his teacher even before he took the cup of hemlock. Still, maybe it was this last amazing act that sealed Plato's opinion of Socrates. No way to know, but unlike a few other deaths that made folks larger than life (James Dean and Nathan Hale come to mind), Socrates' impression on Plato may well have preceded his death. I hope so, anyway--I'd like to believe I make an impression on my students even if I don't drink the hemlock. I like this post. As a first time teacher this summer, I'm trying to do student-centered activities and lab work to answer questions, but I have no idea how to make them really think especially when I'm still developing that way of thought. I've been so focused on giving the kids information but not so many questions that actually require thought. My high school science teacher could always ask those questions, even though the class almost always sat in silence afterward. How do you do it? As far as how any of us do this, it's a balancing act between getting through the curriculum, and jumping on the teachable moments. I cannot overstress how much over-planning (in a good sense) goes into a successful lesson. A good lesson appears to flow organically (and I guess it does in a way), but the teacher needs to anticipate multiple possible directions at multiple points. This did not happen often when I started, and does not happen as often as I like now. Your first year is going to be exhausting, and for many new teachers it's as much (or more) about classroom management than about the lessons. And this little piece of advice may have saved my career--you will need to rest. My supervisor, a wonderful woman, saw me working myself to a nubbin, and insisted that at 11 PM, I go to bed. (I get up at 5:30.) She explained (rightly) that you will never be completely caught up, ever. Work hard, but get your sleep. Doyle, that was wonderful advice which you passed on to Jess. The question I mentioned came to me near to the beginning of my first teaching experience. So 20 years have passed to blur the memory of my response but I remember talking about how he couldn't take what I said with absolute certainty and that science is an attempt to explain what we observe. The more scientists observe and the more time spent with those observations will refine what we end up teaching. Thank you for the advice. My director told me to start to review how each lesson goes and write down how I can improve it. I guess I could think about how the students responded to what I have done and try to plan lessons that will challenge and teach them. And yes, I definitely feel like I'm always behind already. The weekend doesn't come soon enough!